Last Monday, volunteers from the Timbers Stand Together initiative descended on Cedar Park's courtyard to clean, improve, and beautify CPMS' valuable garden space. Through the work of Christina Mackin, BSD's Community Resource Coordinator, and Trisha Parks, CPMS Humanities teacher, Stand Together included Cedar Park on its list of projects for the Timbers-sponsored community outreach. Stand Together is a comprehensive, week-long community initiative that supports dozens of nonprofit projects and volunteer opportunities across Portland. Orchard Supply Hardware at Peterkort donated $200 worth of dirt and plants. The crew arrived at 1PM on Monday, 6/11/18, including volunteers ready, willing and able to weed, trim, clean, level, cart gravel, and move both trellises and greenhouse to new locations. Jack Jewsbury, a favorite retired player, and Foster Langsdorf, a current Timbers player, worked side by side with volunteers from Hampton Lumber and Cedar Park. Elizabeth Tufty's leadership was instrumental to the success of the endeavor. Tufty, a CPMS Math teacher, coordinated the project by gathering the donations, planning the work, and directing the volunteers. Two hot hours later, the courtyard was transformed. Students have used the area to make paper-mache pinantas, complete a science lab, and play jenga. The faculty used the courtyard for the end of year celebration. The couryard cleanup has provided an improved outdoor space for our students to enjoy with their classes during school hours. Since the courtyard is within the school, THPRD does not manage it. Therefore, CPMS is dependent on dedicated teachers and volunteers to weed, clean, water and donate plants for upkeep. The last time Cedar Park had a clean up was 10 years ago through Sunset Presbyterian. Since then, the area had became overgrown and weedy. 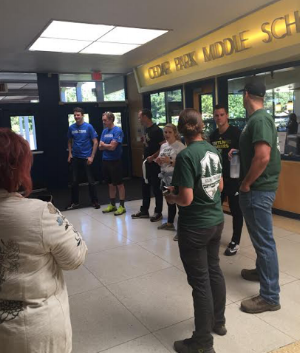 Special thanks to the Portland Timbers, Orchard Supply, Intel, Stand Together, and Columbia Sportswear for their hard work and generous donations. Another round of applause is due to CPMS teachers, Trisha Parks and Elizabeth Tufty, for their hard work and perseverance to make this improvement a reality, as well as to Mr. Steve Tufty, an active CPMS volunteer.